Recently, I participated in a group tour to one of India's most inaccessible and remote corners, where even road connections are extremely poor. I found this travel a real tough job, as we had to cross hundreds of kilometers every day in a car with poor infrastructure available, bad roads and places of stay of reasonable quality far flung and remote. Whenever we had reached any new town, invariably the first discussion amongst our group would always be whether we got mobile coverage on our phones and if so, was there 3G coverage too? Let me explain. Like many other countries, India's mobile telephony sector is fiercely competitive. Entire country has been divided in 18 mobile telecom circles and telco companies have to bid for spectrum for each and every circle separately. This leads to a situation where the services of one particular mobile service provider may not be available in all circles. For example, the service provider, who provides service in my home state does not have a network in all other states or circles. Telcos usually overcome this lacuna by signing agreements with other service providers so to have a seamless mobile coverage. For phone calls and messages, this arrangement works fine, but when it comes to internet coverage, the tie ups do not work so well and work out to be expensive. In addition, the problems gets augmented in remote or border areas, where because of low traffic, these areas make themselves less attractive to private sector telcos and are reluctant to spread their networks in such areas. For a smartphone user, this creates a real obstacle in accessing internet because in certain areas, phones and messages may be available but 2G or 3 G coverage, essential for internet connectivity, may not be there and his smartphone would have no use. With the only exception of Government run service provider BSNL, this holds true for all other private service providers. Growth of mobile telephony in India has now become an old story. Today, there are are more than 800 million mobile users in India, which means that out of every three Indians, two are mobile users. What is interesting to note is that half of new phones sold in Indian market are actually smartphones. This aspect needs to be noted when we talk about development of internet in India. The internet, which was first introduced to US consumers sometime in late eighty’s or early ninety’s, essentially grew on back of strong growth in sales of personal computers and then laptops. Compared to US, sales of PC's and laptops in India not only remain smaller but are actually declining. It is very clear that sales of personal computers and laptops do not drive up growth of internet in India. If we look at the growth prospects, there are many surprises in store. There were 213 million internet users in India by end of December 2013. In October 2014 there were 278 million internet users. This figure is expected to grow to 302 million by end of this year and to 354 million by June 2015. This would mean that the internet users are growing at 32%. The report says that India has the third-largest Internet user base in the world at present. China leads with more than 600 million Internet users, followed by the with estimated 279 million users and then by India with 278 million users. This also means that by end of this year, India will overtake the US as the second largest Internet users’ base in the world. How this became possible, when sale of PC's and laptops is actually declining in India? The simple fact is that internet is growing in India on back of smartphones and tablets. According to some figures published in Times of India, 2.66 million tablets were sold in 2012 and around 6 million in 2013. The 2014 sales figures are likely to be much higher. Similarly smartphone sales are growing at a rate of more than 200%, year on year basis. 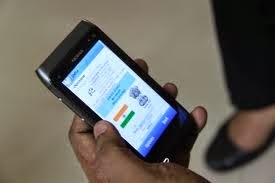 According to latest figures, about 159 million users access the Internet on mobile devices in India. This is estimated to touch 173 milllion by December 2014. Many would believe that internet users must be concentrated in the urban areas only and rural areas may not have many takers. The situation today does look something similar. In October 2014, out of 278 million users, as many as 177 million users were from urban centers and growing at 29% rate. However in rural area, where there were 101 million users in October 2014, the growth rate is much higher at 39%. I know a lady who is an illiterate, yet uses a mobile phone effortlessly. Once I asked her how she reads the contact list. She said that she can identify a contact's number by looking at list and can identify the correct name. I would not be surprised if in a short time from now, she buys a smartphone and even starts accessing internet to see photos and videos even when she can not read a thing. The internet growth figures in India are simply astounding. I am sure that during next 2 or 3 years, we would have hundreds and hundreds of new India specific Apps. Government wants to increase broadband coverage to promote internet use. That is fine but what really would drive more and more users to access internet are better 2G, 3G or even 4G coverage at substantially reduced data tariff rates.